Giving up smoking is hard work, yet there is plenty of good reason to do so. As of 2015, 17.2% of the adult population in the UK were smokers, despite there being in 2013 over 78,000 deaths caused by smoking among adults over 35 years of age in England alone. Fortunately, there is much information and support available to smokers who want to quit. Before you give up smoking…. Make a list of all the reasons you want to quit. Of course, health and money are both huge factors, but try to make these reasons specific, such as, “I want to enjoy playing sport with my friends”, or, “I want to use the money I save from not smoking to go away for a long weekend”. It may be helpful to write your list on an index card so you can keep it with you for inspiration. Identify your triggers. Most smokers have more than one thing that prompts them to smoke, such as needing a cigarette after a meal or while having a drink, or smoking when stressed. Knowing what drives your psychological desire to smoke can help you to find different, healthier alternatives when those situations occur. Set “start quit” and “end quit” dates. Your start quit date is the day you start cutting back and implementing replacement behaviours. Your end quit date is the last day you smoke at all. Be realistic with your time frame; a week or two generally isn’t enough time for most people to quit. Allow up to 12 weeks to fully beat the habit, but then be very clear about sticking to those dates and the steady progression between them. Get active. Even just a little exercise can be very effective at reducing your cravings. So rather than suddenly start exercising once you’ve quit, prepare your body by getting into a simple, daily stretching routine at home. Regularly walk around the block, or if you feel like it, something more strenuous, such as a jog or organised sport – just keep all these routines manageable and not so demanding that you’ll struggle to keep them up. At this point, you know why you want to quit, some useful tips to help you quit, and when you are going to quit. Now it’s time to consider what treatment could prove invaluable to getting you over the line. Prescription medication available from Dr Fox. In combination with counselling, prescription smoking cessation medicines are highly effective. Champix (varenicline), was approved for use in the UK in 2006. Side effects are generally mild and can be lessened by taking the medication with a meal. Since the drug stimulates nicotine receptors in the brain, patients have fewer (and less severe) cravings without actually consuming any nicotine. Gradually building up the dosage before the target quit date allows the body to adjust to the drug, and it can be stopped immediately once the patient has completely stopped smoking and is free of nicotine. 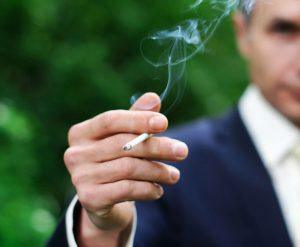 Many patients can expect to be smoke-free in about 12 weeks. Nicotine patches. Patches are a long-trusted way to help with smoking cessation, but they aren’t without their issues. Common problems include side effects such as skin irritation, disturbed sleep and headaches. Nicotine gum/lozenges. Another standby in the world of smoking cessation, gum and lozenges work to reduce cravings by slowly releasing nicotine into the body. The idea is to gradually wean yourself off the product until the body is nicotine-free. One oft-reported problem with nicotine gum is that people remain dependent on it for a long time. Side effects include nausea, oral and dental problems, and heartburn. E-cigarettes/vaporizers. E-cigarettes have exploded in popularity over the past few years. They come in a wide variety of flavours, nicotine levels, and designs. But while e-cigarettes have been licensed by the MHRA as medicine, there is some debate as to their effectiveness. WHO (the World Health Organization) has expressed concern over the use of e-cigarettes, stating that there isn’t enough evidence to prove that the products help people quit smoking. You successfully gave up smoking! Now what? Congratulations! In addition to a myriad of health benefits, you can expect improved senses of smell and taste, less yellow fingers and teeth, better-smelling clothes, and the satisfaction of knowing that you beat an incredibly addictive habit. Reward yourself by exploring a new hobby, taking a trip, or buying yourself something special. Most of all, enjoy living your life as a non-smoker! If you’d like some more information on giving up smoking, visit Smokefree for some great resources, support and success stories. Posted on January 1, 2018 December 27, 2017 by Dr Tony Steele in Stop smoking.